Image caption Fire crews from across Staffordshire battled the blaze at the Planet Bollywood restaurant. 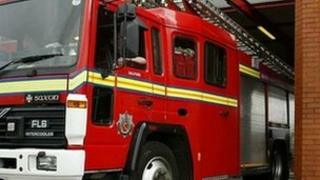 Fire crews have left the scene of a restaurant blaze in Staffordshire. The fire broke out on Tuesday night at Planet Bollywood on Glebe Street in Stoke-on-Trent. At its height, six crews were in attendance. Firefighters remained at the scene for 24 hours to carry out onsite inspections. Firefighters believe the blaze was caused by the kitchen extractor fan catching fire, causing flames to rise to the roof. Staffordshire Fire and Rescue's spokeswoman Michelle Pearson said: "The incident is now closed and fire crews have left the scene."